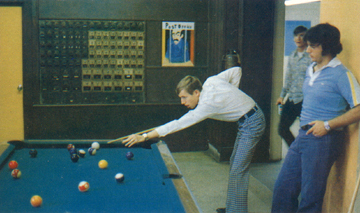 Pool table in the Grill, from the 1977 yearbook. The 'Post Office' painting on the wall in back next to the mailboxes was done the previous year by Mrs. Suarez. Mr. Cook can be seen in the background, but who are the guys playing pool? The "notorious" Alan Forget (Class of '79) writes in response: The photo of the guy shooting pool in the grill with Mr. Cook walking in was one of mine. The guy shooting pool was there only for 1 year. He was our math teacher (I can't remember his name) and also J.V. basketball coach. This was the same year that Mr. Boyd from Mt. Dora came over and coached Varsity basketball. As to the guy in the foreground, his name slips my mind.